Having packed away the fresh wreath making ‘production line’ for another year our next job is to get our home grown willow rods cut and into storage for processing as willow whip tips for floristry, straight sticks for crafts and little log bundles for picks to decorate next year’s wreaths. These items are sold all year round on our Wreath Supplies website. 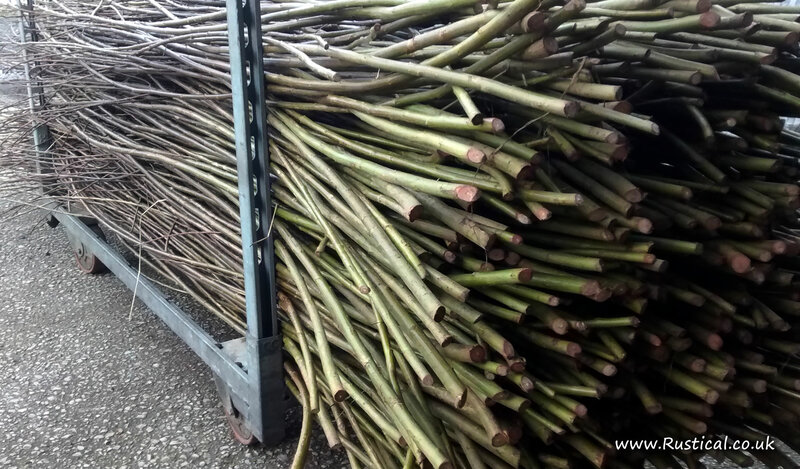 After Christmas we start harvesting the willow to fulfill any orders for full length willow rods received. Don’t worry if you haven’t ordered as there usually is a surplus and the rods are available to buy for willow weaving, basketry and sculptures at just 20p each. In response to those people who want to create their own products from scratch we do allow people to select and cut their own willow rods directly from the field. This is priced at £30 an hour (or part thereof) for the first cutter and £10 an hour for each additional cutter in the same party. All the willow you cut is yours to take away at no additional cost. Fresh willow is available January to March by appointment. Ring Mark on 07834 324080 for more details.